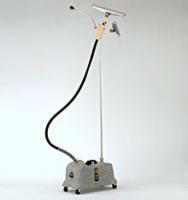 The heavy duty Model J-4000"I" Commercial all-purpose steamer is equipped with 1500 watts of steaming power. The J-4000"I" is equipped with a 5 1/2 foot flexible hose and 4 interchangeable steam heads consisting of a 9" bent aluminum pipe head attachment, "B" brush steam cleaning head, 6" wide metal steam head and a 12" wide carpet steam head. This model has a 1 gallon self-contained water tank with preheat and steam settings. It contains a sight gauge on the side of the steamer to view water level and sediment build-up at a glance. The J-4000"I" heats up within 15 minutes to preheat temperature and produces steam within 2 minutes once at the preheat temperature. "I called on the phone to place my order and ask some questions. The girl was VERY helpful."